A course for this game is situated in the Svatý Petr Ski Area in Špindlerův Mlýn. A game can be bought in the Spindl Motion Shop & Rental Svatý Petr, which is open daily from 8:00 am to 6:00 pm. 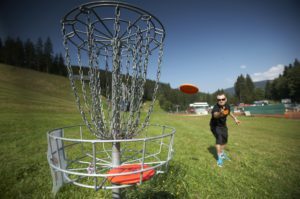 Disc golf is a popular sport featuring a flying disc, derived from classic golf. It originated in the 1970s in the US and has been gaining more and more fans all around the world. The goal of the game is, similar to golf, to hit a hole with the fewest number of strokes – i.e. throws. The disc is thrown at the target (hole) from a designated “tee box”. The hole comprises of a steel basket. The average distance to the hole is around 50 metres and can be reached by three throws. After the first throw the player throws from the spot where the disc came to rest and continues until he/she hits the target. The person who completes the entire course with the fewest number of throws wins. The disc is thrown from a designated tee box at a target (steel basket). A hole is complete if the disc is in the basket. The number of throws necessary to throw the disc into the basket is your score. Every throw that follows starts at the spot where the disc sits following the previous throw. The player who is furthest from the target always throws first. A round is begun by a player who had the lowest score at the last played basket. If the disc is unplayable, it should be thrown from the nearest possible place. Players may not change any part of the course to make a throw easier. Safety first – make sure that there is no-one within the area of a throw.